Toward the end of last year we got rabbits. 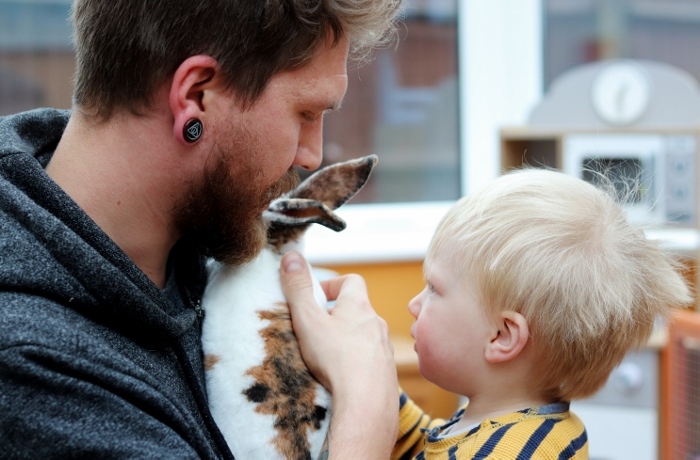 We’ve had a rabbit before, and to be honest I was a little sad about not being pregnant (little did I know that I actually was) and I wanted to get a pet that Henry could properly interact with as our cat isn’t particularly interested in being cuddled by a toddler. So we got a pair of female bunnies and set them up to live in our playroom/conservatory. 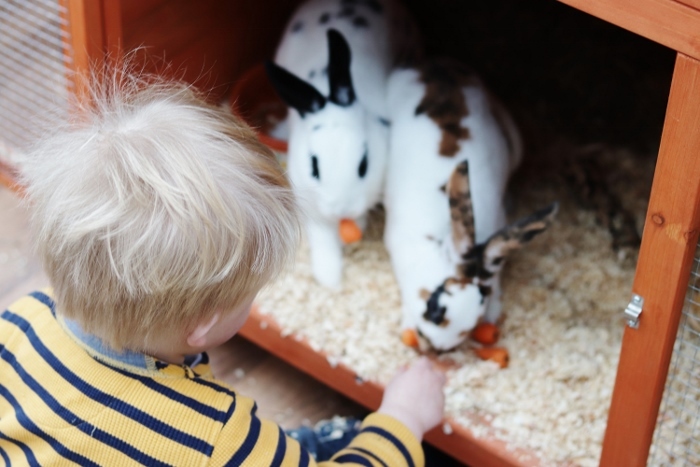 As I’ve had a few questions over social media about the bunnies and Henry I thought I’d do a mini guide to owning rabbits and how we make it work with a very excitable little boy. We have the girls in a two-tier hutch in our conservatory. We checked with Pets at Home before buying to ensure they would have enough space, and this provides plenty. We’re also planning on getting a Run for the summer so they can go on the grass in the garden (free lawn maintenance) in a shady spot. Within the cage with have sawdust for the floor, straw for their upstairs bedding, hay to eat and veggies and nuggets in the evenings. They also have a mix of chewable toys as well. 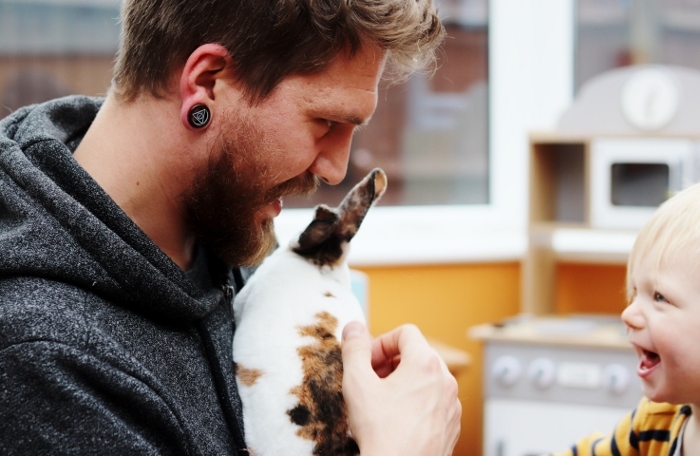 We try to ensure we have cuddles with the rabbits a couple of times a week so they are used to being handled, and hopefully making our life in general easier with them. Our previous rabbit hated being picked up which created quite the hassle when taking her to the vets. Both girls are really friendly and don’t mind a cuddle or a stroke, so it’s just a case of keeping that up. The big ‘un. 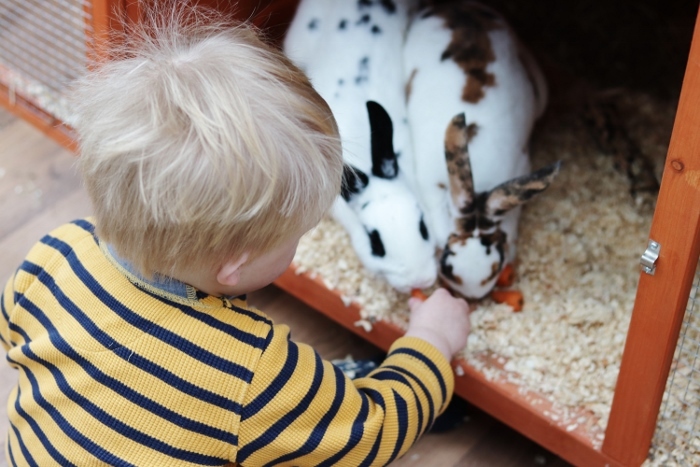 Getting the rabbits used to a slightly rampant toddler. To be completely fair they have a huge amount of tolerance and like most animals will just find a safe place to hide if they feel threatened. We ask Henry to help us feed the rabbits every evening as we give them nuggets and veggies at night, which Henry carries over and hand feeds to them. We also sit Henry down for cuddles with the rabbits and supervise him stroking them. Sometimes the excitement is a little much so he needs a couple of minutes of quiet time, but on the whole he is incredible gentle with both girls and he’s taken the extra responsibility of carrying and feeding them veggies very well. 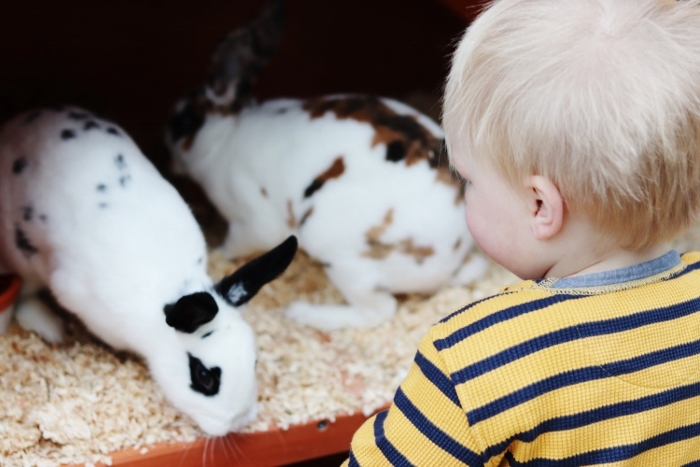 I do think a lot of it is down to the temperament of the rabbits – whom are both very chilled – and a lot of trial and error, and plenty of supervision. We have had a few incidences of Henry unlocking the cage when we haven’t been in the room, but it’s about reinforcing not to do it without mama or daddy helping. The last couple of months have been great to see him growing to love them and taking his new responsibilities in his stride. "Our gender reveal and scan with Babybond"